This piece was struck to "etch in evocative gold the day of Northern Transylvania liberation and to be transmitted and inherited from generation to generation the concrete remembrance of these history pages". The medal was related to the National Restoration Loan, a public loan that was to be used to pay the war debts of Romania. Such a medal could be bought for 15.000 de lei by those who had bought state titles in amount of 50.000 lei. On the reverse are depicted the coats of arms belonging to the Romanian counties in the northern Transylvania ripped in 1940 by Hungary with the support of fascist Germany and Italy. They are, in counterclockwise order, starting at 12 o'clock: Trei Scaune, Năsăud, Odorhei, Cluj, Satu Mare, Bihor, Sălaj, Maramureş, Mureş, Ciuc and Someş. In 1944 this territories were being liberated. One might think this is not actually a coin because no denomination value is to be found on either sides. In fact this coin was struck almost accordingly to the Latin Monetary Union rules and characteristics the 20 lei gold coins issued in the 19th century conformed (20 lei 1868, 20 lei 1870, 20 lei 1883 (1884) or 1890, 20 lei 1906, 20 lei 1922). Besides, the coin was struck in a satisfactory number, one million pieces, so that it circulated along the other gold coins. Being made of a precious metal, this is a golden COIN made in the acception of medieval and ancient coins. Moreover, the piece was actually used in the era as coin, although the use was not legal. -effigy of Michael, the reigning king. The word ARDEAL you can see is the oldest name Transylvania bore. Inside book The History of Coins in Romania (Chronology - Bibliography - Glossary) written by renowned Romanian numismatist Octavian Iliescu (Editura Enciclopedică, Bucharest, 2002, in English) the hypothesis is presented that the mass difference between the medal and the coin standard appeared as an error happened at the mint; the pieces should have had the same characteristics as the usual 20 lei coin. Initially the National Bank had provided enough gold for 1.000.000 pieces of 20 lei. Because the mint has struck the pieces a bit heavier, another 100 kilograms of gold were delivered from the bank's reserves. The "Transylvania of Ours" medals were struck and sold based on the Law no. 656, published in Official Gazette no. 298 from December 23rd 1944. We quote below the articles of that law. Article 1. The Ministry of Finance is authorized to strike through National Mint and to sell gold commemorative medals, up to a maximum of one million pieces, having the characteristics given at article 3. Article 2. The price and the selling conditions of these commemorative medals will be set up through a decision of the Minister of Finance. a) The medals are made from gold and copper alloy. b) The title of the alloy is 900 to a thousand gold, with a tolerance of +/- 2 at a thousand, consequently it can vary from 898 to 902 at a thousand. c) The color of the medal is yellow-golden, corresponding to the title of the alloy. a) The diameter of the medal is of 21 mm, with a tolerance of +/- 0.05 mm, consequently it can vary between 20.95 and 21.05 mm. b) The weight of a medal is 6.55 grams, with a tolerance of +/- 2 at a thousand, namely it can vary between 6.5369 and 6.5631 grams. a) The face (obverse) of the medal represents the effigies of HM King Mihai I, of King Ferdinand I, both wearing the war helmet and of Michael the Brave, wearing the characteristic voivodal cap. The effigies are in profile, superimposed, to the left. 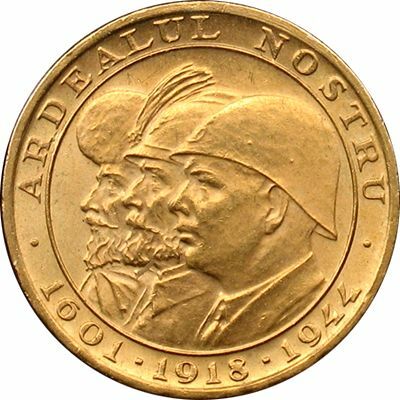 Around the effigies is engraved with capital letters the text: "Ardealul nostru" and years "1601, 1918, 1944". The portraits are framed inside a thin circle in relief. b) The back (reverse) of the medal has engraved in the middle the head of the heraldic eagle from the country's coat of arms, having written in the lower part the text "Romania". 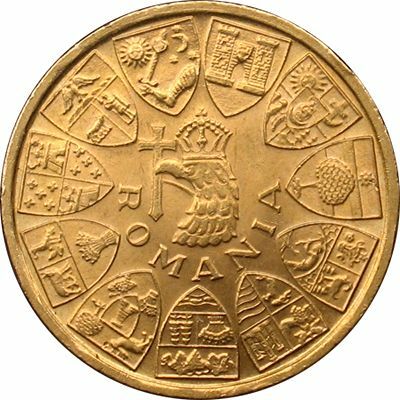 Round about are represented the coat of arms of the 11 counties from Northern Transylvania, recovered in year 1944.
c) The edge of the medal forms a flat cylindrical surface, having incuse, with capital letters, text "Nihil sine Deo". Article 4. The commemorative medals put on sale in the conditions of the present law are assimilated with the objects made of precious metals excepted from the legal restrictions concerning their possession and circulation, in conformity with article 3 of Law no. 1907 from August 12th 1936, modified by Law no. 3203 from September 12th 1938, published in Official Gazette no. 213 from September 14th 1938. 3. the mass of the coin is 6.55 grams through the will of the lawmaker and not due to an error, so the difference between the medal/coin and the gold 20 lei coins was intentional. The Law no. 284 from August 15th 1947, published in the Official Gazette in the same day, stipulated that the gold, the foreign currencies and other means of payment must be handed to the National Bank of Romania. The medal "Transylvania of Ours" was explicitly mentioned in more than one article of this law (articles cited in the following paragraph). The confiscated values in the advantage of the State will be liquidated for the state at the official exchange rate. The National Bank of Romania will retain from the value in lei of the confiscated goods 25% for its suing costs and 20% for distributing as bonuses, from which 10% for the denouncer and 10% for the discloser [...]. Article 16. The demands of the Law no. 656 from 1944, concerning the circulation of the commemorative gold medals, are and remain abrogated; the demands of article 7, b from the Law no. 638 from 1946 are also abrogated.